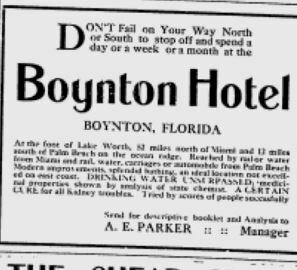 When I was collecting information on Major Nathan S. Boynton’s hotel on the beach, I found many old ads for the hotel in The Tropical Sun and the Miami Metropolis, the area’s first newspapers. One of the peculiar findings was the hotel’s seemingly “magical” water for curing all sort of ailments. The ad states that the water is “unsurpassed,” a “certain cure for all kidney troubles.” It was even analyzed by a state chemist! Of course having healthful water with curative properties was a ploy used by many hotels of the time, especially in Europe. A.E. Parker, the hotel’s manager, was originally from England and may have gotten the idea from growing up across the pond. Maybe Boynton Beach should be bottling its special water. Tagged A.E. Parker, Boynton Hotel, kidney cures, Major Nathan S. Boynton. Bookmark the permalink.